Brighten your loved one’s home and display the wonderful unity of family this holiday season with this Family Word Art Canvas- a customized canvas gift with a special touch! Good art can be hard to find. How do you capture an emotion or specific feeling in an image that speaks to you? You want something that evokes in you that same emotion every time you look at it, and you want it to last the test of time. They say a picture is worth a thousand words, and we have just the right combination of emotion-evoking looks and meaningful words with our personalized family word-art canvas! 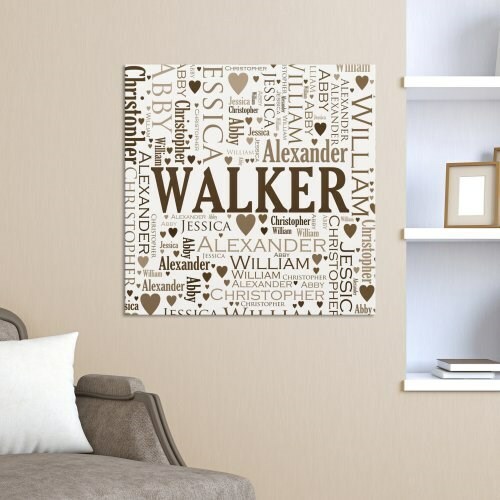 You can’t go wrong with this customized work of art featuring all the names of the special people in your family – arranged together in various sizes, and complementary fonts, angled up and down and across, all organized around a large center placement of the family last name. And not only do you get to arrange all of your family’s names but you get to include up to 5 symbols to punctuate and decorate the names in your design. Choose from hearts, diamonds, stars, religious symbols, a graduation hat, a balloon, a ribbon, a flower and fancy filigrees. In addition, you get to choose what color you’d like to use – the options here are endless as we include the opportunity to select from a color picker tool or even enter the RGB info for a specific shade you’re hoping for to go with your home décor. Further customize your personalized canvas gift by selecting the canvas size (16×16, 18×18 or 20×20) and even the thickness of the canvas frame (meaning how far your art will stand out from the wall when it’s hung), in either ¾” or 1-1/2″ depths.